Get familiar and learn the basics of the MadgeTech 4 Data Logger Software in simple and easy steps. Check out the latest video tutorial demonstrating Value Lines in the MadgeTech 4 Data Logger Software. A Value Line is a visual horizontal line on a graph report representing a specific calculation or user selected value within the recorded data. There are 5 options for Value Line types; Minimum, Maximum, Average, Mean Kinetic Temperature (MKT) or Fixed Value. Check out the video tutorial demonstrating Workflows in the MadgeTech 4 Data Logger Software. The Workflows feature allows the user to automate tasks to efficiently download data, create reports and more. A Workflow is a saved set of instructions that tell the software to perform tasks when specified conditions are met. Check out the video tutorial demonstrating Time Markers in the MadgeTech 4 Data Logger Software. Time Markers offer users the ability to mark specific points in time, within a dataset as desired. This video walks step by step through the easy configuration process. 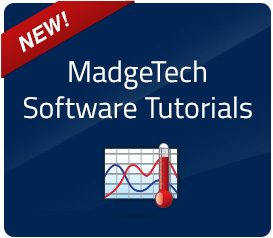 Check out the video tutorial demonstrating the MadgeTech 4 Data Logger Software. This video provides an overview and tour of the software interface and powerful features. Check out the video tutorial demonstrating the configuration and use of the Trigger Settings feature in the MadgeTech 4 Software. This video walks step by step through the process and shows an example application of how it is used.